The modern parish of Sheringham is located on the north Norfolk coast, to the west of Cromer and the northeast of Holt. The town occupies most of the parish, with fields and a golf course in the west and Beeston Common in the southeast. The northernmost section of the parish includes beach and cliffs. Little archaeological work has been conducted in the parish. No excavations have taken place, with only a few watching briefs recorded. Although some metal detecting and fieldwalking has taken place, most of the known artefacts are the result of chance discoveries. In comparison, a reasonable amount of sites have been identified on aerial photographs. There are over twenty records of prehistoric flint artefacts found in the parish. The earliest items include four possible Palaeolithic handaxes (NHER 6312, 6314 and 6317) and Palaeolithic flakes. Later prehistoric objects include flakes, scrapers, Neolithic axeheads, a Neolithic chisel (NHER 6322) and a Bronze Age barbed and tanged arrowhead. A Neolithic or Bronze Age quartzite axe hammer (NHER 6325) has also been found. Nearly all were stray finds, with examples found on the beach, eroding out of the cliff faces or in gardens. Unfortunately the findspots of less than half the discoveries are known. Prehistoric burnt flints at a site on Beeston Common may indicate the location of a prehistoric burnt mound (NHER 34756). A Bronze Age ring ditch, two possible ring ditches or enclosures and possible linear features (NHER 29763) are visible as cropmarks on aerial photographs and are located in the west of the parish. The Bronze Age ring ditch is the remains of a barrow and the possible features may be late prehistoric in date. A complete Beaker pot (NHER 34486) was found close to the ring ditch during grave digging at Sheringham Cemetery. It is probable that it came from a Bronze Age burial, perhaps one of a similar period or phase to the ring ditch. Three Bronze Age socketed axeheads and a Bronze Age palstave have also been discovered in the parish. At least five (and possibly as many as eight) Iron Age coins have been found in the parish. Four were found on Sheringham beach, with three collected on the beach between Sheringham and Weybourne. One was found in a cliff face. All were minted in northeast Gaul. A collection of Iron Age pottery in British Museum was found somewhere in the parish. Roman coins, metalwork and pottery have been collected at various locations in the parish. Coins and pottery have been found on the beach and in cliff faces. The finds include a probable late 2nd century AD coin hoard (NHER 18640). An Early Saxon brooch is recorded, as is an unidentified object of Early to Late Saxon date. Sheringham is recorded in the Domesday Book of 1086 as ‘Silingeham’. This is an Old English placename meaning the ‘homestead of Scira’s people’. The Domesday entry covers both Sheringham and Upper Sheringham parishes and mentions a church, villagers, smallholders, slaves, ploughs, woodland, pigs, meadow, a horse, cattle, pigs and goats. In 1086 land at Sheringham was held by William of Ecouis. During the medieval period, settlement in Sheringham parish was based around a small fishing village. There was a medieval chapel dedicated to St Nicholas, although where it stood is uncertain (see NHER 6418 and 13181). In the south of the parish a well-defined medieval hollow way or sunken road (NHER 24267) survives. The medieval metalwork found throughout the parish may have been lost or discarded by occupants of the village. Coins from Gelderland (now part of the Netherlands; NHER 28046) and Flanders illustrate Sheringham had continental contacts in the medieval period. A post medieval watermill (NHER 15242) in the centre of the parish is marked on Faden's map of 1797. In the centre of the parish probable post medieval quarries (NHER 38340) are visible on aerial photographs and are marked on Ordnance Survey maps. They were probably associated with a nearby brickworks. Banks and ditches (NHER 9872) survive in Sheringham Wood and are also visible on aerial photographs. It is probable that they are boundary markers and they are post medieval. During the 1940s a group of silver coins (including coins of Charles III of Spain, Naples and Sicily and one of Louis XIV) were found in the east of the parish. By 1850 over 100 fishing boats were being launched from Sheringham beach, with lobsters and crabs the main catches. During the 1880s the railway link (NHER 13584) was completed and Sheringham village began to develop as a coastal resort. In 1887 a street was constructed to link Sheringham station with the sea front. 1895 saw the construction of a seawall and promenade and a plaque (NHER 41555) incorporated into the modern sea wall commemorates this. In 1906 the railway/sea front street was lined with poplars and the circular St Nicholas's Gardens were laid out. Grand Lees and Burlington Lees gardens on the cliff top were also established. St Peter’s Church (NHER 6418) was built between 1895 and 1897. It is constructed of red brick faced with knapped flint. 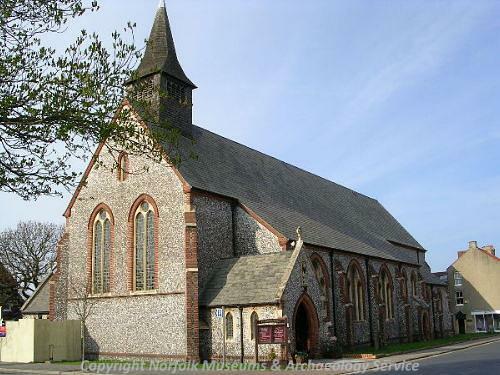 It stands close to the site of an early 19th century mission chapel and was established as a daughter church of All Saints, Upper Sheringham (NHER 6305). In 1953 it became parish church for Sheringham. In January 1897 the vessel 'Ispolen' was wrecked at Sheringham. This may have come ashore on the beach in the west of the parish, close to where a wreck (NHER 13182) thought to be it was recorded in 1966. A wreck recorded on the eastern beach in 1988 (NHER 22439) may also have been the same boat. If so, it was moved eastwards by tidal action between 1966 and 1988. On the cliff top in the east of the parish possible World War One military trenches have been identified. During World War Two there were a lot of military sites in the parish. These included sites on the cliff tops, in town and in the south of the parish. 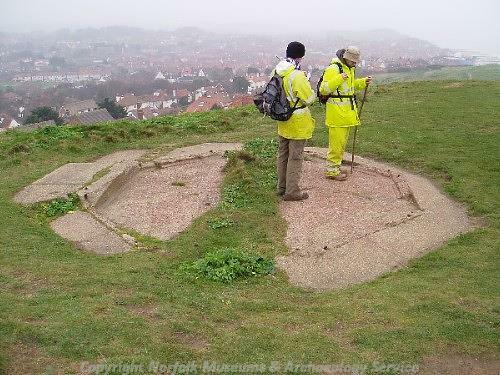 On and around Skelding Hill there was a coastal battery, underground headquarters, huts and associated features. On and around Beeston Bump were an observation post (NHER 21298), pillboxes, gun emplacements and other features. In the town there were several road blocks and groups of concrete anti tank cubes. To the south of the town were practice trenches, a gun emplacement and an underground headquarters. David Robertson (NLA), 23 December 2005.
http://www.northnorfolk.org/sheringham/downloads/ABriefHistorOfSheringham.doc. Accessed: 23 December 2005.
http://www.poppyland.co.uk/norfolk/sheringham.htm. Accessed: 23 December 2005.